With very few exceptions, the vast majority of top-tier players are established and well-known to the common fantasy owner. While these players are integral components of a championship team, under-the-radar options with high potential -- better known as sleepers -- can pay huge dividends in fantasy leagues as well. Whether drafted or added off waivers, these players typically are undervalued on draft day but ultimately can become major fantasy commodities by season's end. Sleepers are extremely unpredictable every season, but the bottom line is these players end up outperforming everyone’s expectations, regardless of their age, team or position. This week, NHL.com fantasy insiders Sergei Feldman, Pete Jensen and Matt Cubeta take in-depth looks at underrated players who should be on your fantasy team's radar entering drafts. Each expert will provide 10 sleeper picks with corresponding stat projections (in order of preference), along with five additional candidates for fantasy owners to keep an eye on. Faulk's performance at the 2012 World Championship is enough to get him on this list alone. In eight games for the United States, Faulk recorded four goals, four assists and a plus-nine rating -- his eight points as a defenseman were fourth among all blueliners in the tournament. Push aside this performance and take a look at his Hurricane production and it'll become even more obvious that Faulk is in line for a monster season at just 20 years old. In 66 games last season, Faulk totaled eight goals (five on the man advantage), 14 assists, a minus-16, 29 penalty minutes, 12 power-play points and 101 shots on goal. While the minus-16 might jump out at you, you should expect that number to improve significantly with the Hurricanes' new-look team. Faulk received more than three minutes of power-play time per game last season and will quarterback the top unit again in 2012-13. It's not out of the question to think he could finish as a top-20 d-man this year -- expect Jack Johnson-like production with a better rating. At 26 years old, Dubnyk will be entering his fourth NHL season with the Oilers, and this year, we could start to see why Edmonton selected him with the 14th pick in the 2004 Draft. Despite playing on a team that finished 14th in the Western Conference last year and tied for 19th among all teams by allowing 30.7 shots on goal per game, Dubnyk still put up solid numbers -- a 20-20-3 record in 47 appearances to go along with a respectable 2.67 GAA, .914 SV% and two shutouts. During the early parts of last season, veteran Nikolai Khabibulin emerged as the team's No. 1 goalie, but after performing significantly better down the stretch (a 1.95 GAA, .934 SV% in nine March starts and a 2.25 GAA and .930 SV% in four April starts), the Oilers appear committed to letting Dubnyk run with the starting job in 2012-13. Dubnyk has seen his stats improve in each of his first three seasons and that should be the case going forward. With Edmonton expecting a healthy Ryan Whitney on defense and Justin Schultz also on the blue line core, Dubnyk has the potential to be a top-15 fantasy goalie and should be drafted ahead of more household names like Martin Brodeur, Brian Elliott and Corey Crawford. Since his breakout season for the Avalanche in 2009-10 (28 goals, 64 points, 73 PIMs), Stewart simply hasn't been the same. In his first full season with the Blues last year, Stewart posted just 15 goals and 15 assists in 79 games -- his 109 PIMs were a career-high, but Stewart was expected to do much more than just add PIMs to your fantasy team. 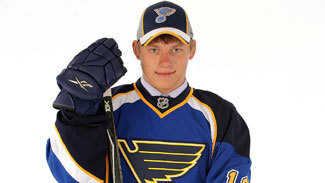 At just 24, St. Louis still has high hopes for Stewart and he is expected to line up as the team's No. 2 right wing, on a line with the now healthy playmaker Andy McDonald and Patrik Berglund. Stewart can still be a lethal fantasy performer thanks to his ability to score goals and record penalty minutes, and don't be shocked if he finds himself with numbers close to Brad Marchand's by season's end. Many pegged Schenn as a sleeper going into last year, but unfortunately, he didn't quite live up to expectations. That was, of course, until he went on a tremendous playoff run for the Flyers. In 11 playoff contests, Schenn recorded three goals and six assists while skating primarily on the team's second line with Danny Briere and Wayne Simmonds -- and that's the exact line Philadelphia plans on keeping together in 2012-13, meaning good things will come. Schenn received 1:41 of power play time per game last season and that number should continue to increase this season as Philly's No. 2 center. Schenn will be a 30-plus-goal-scorer in the NHL, it's just a matter of when, not if -- we think he'll come close this year. The 21-year old has yet to appear in a regular season NHL game, but already has high expectations entering his rookie season with the Rangers. Kreider flew onto the scene during New York's first-round playoff series against Ottawa and ended up with five goals and two assists in 18 playoff games for the Rangers. While those stats aren't eye-popping, Kreider's maturity, confidence and build (6'3", 230 pounds) already have everyone believing he can perform immediately. The other thing to notice is that Kreider is expected to start among the team's top-six forwards, and that can be a major factor for fantasy owners. When three-time 40-plus goal-scorer Marian Gaborik returns to the lineup, you could see Kreider on a line with Gaborik and Derek Stepan in the middle, and that could mean big things for Kreider. Don't draft him too high, but if you can select him as a depth bench player, Kreider could turn out to be the most valuable fantasy sleeper on this list. While Cervenka may be an older NHL rookie (26), he still has the skills to develop into a very valuable fantasy commodity. Playing in the KHL, Cervenka recorded 100 points in 105 games over the last two regular seasons -- he also led the KHL with 21 points on Omsk's 20-game playoff run in 2011-12. Cervenka is expected to fill the shoes of the departed Olli Jokinen and will center the team's second line with Jiri Hudler and Sven Baertschi on the wings -- a line loaded with fantasy sleepers (Jensen's take on Baertschi, Feldman on Hudler). However, if things don't go well on Calgary's top line with Michael Cammalleri in the middle, there's a chance Cervenka could center Jarome Iginla and Alex Tanguay, thus increasing his value even more. With Cervenka's maturity and skills, there's a possibility he could take home the Calder Trophy this season -- make sure he's drafted in your fantasy league. Who's going to replace Rick Nash's usual 30-plus goals annually? How about Atkinson? He might not put home 30 this season, but he will at some point during his career. Atkinson, a natural scorer, will finally see his name regularly among Columbus' top-six forwards and that could result in big things from the 23-year-old Boston College product. Atkinson notched 14 points in 27 games after being called up in late February for good -- a rate of .52 points per game -- but what's most notable is how he closed out his rookie season with five goals in his last two games and 10 points in the final six. While he won't sustain those rates, there's reason to believe Atkinson could score 25-plus goals as early as this season. Despite being just 5'7" and 172 pounds, he will be counted on for heavy production on a team that lacks scoring and he should see ample power play time after receiving 2:46 per game in his 27 games last year. With Columbus possessing several new and talented young players (Dubinsky, Foligno, Anisimov), none may see more value than Atkinson, who could lead the team in goals and should be drafted with complete confidence. For the second season in a row, Ellis finds himself among my list of fantasy sleepers. Yesterday, Pete Jensen discussed Nashville defenseman Roman Josi as a fantasy sleeper, and while Josi is useful, in my opinion, Ellis is the player that could see the biggest increase in fantasy value with the departure of Ryan Suter. Josi is expected to be paired up with Shea Weber during even strength and short-handed situations, but he's more of the stay-at-home d-man with Weber lurking as the offensive threat. Ellis is more like Weber in this matter, and with his offensive abilities, he should find himself on the top power-play unit alongside Weber. Ellis appeared in 32 games for the Predators last season, compiling just three goals and 11 points, but four of them came on the man advantage, and you can expect more of that in 2012-13. Expectations remain high for Ellis after his historic season in the OHL in 2010-11 (24 goals and 101 points in 58 games) and there's no reason to think he can't live up to those expectations as early as this season. Draft him as a No. 3 or 4 d-man on your squad and watch him flourish into a top-25 blueliner by season's end. Turris has a name most of us know by now. And after he was traded from Phoenix for Ottawa, he finally started to live up to that name. In 49 games with the Senators, Turris registered 12 goals, 17 assists, a plus-12, 27 penalty minutes, five power play points and 133 shots on goal -- numbers far better than he ever showed with the Coyotes. Perhaps the scene change was all the 23-year-old needed, as things clicked right away for Turris as the team's second-line center behind Jason Spezza (three points in his first three games). Turris again is expected to center the second unit and should find captain Daniel Alfredsson and newcomer Guillaume Latendresse (I also like him as a sleeper) on his wings. No one has ever questioned Turris' skills, so why not take a flyer on him in your fantasy draft and hope he continues to improve and develop as a player each year. Selected ninth in the 2010 draft by the Wild, Granlund has already made a name for himself after scoring the "goal heard around the world" for Finland in the 2011 World Championship. Prepare yourselves to hear more of his name in 2012-13, as Granlund will be Minnesota's second-line center behind Mikko Koivu and could produce immediately in his first NHL season. Just 20 years old, Granlund led the Finnish Elite League with 51 points in 45 games last season and should post over 40 points this season with room for significant growth. With the Wild adding Zach Parise and Ryan Suter this offseason, Granlund's presence has been overshadowed, but he should still have fantasy value this year. He might not deliver a rookie-of-year caliber season just yet, but he's worth a flyer with your last pick in a fantasy draft.